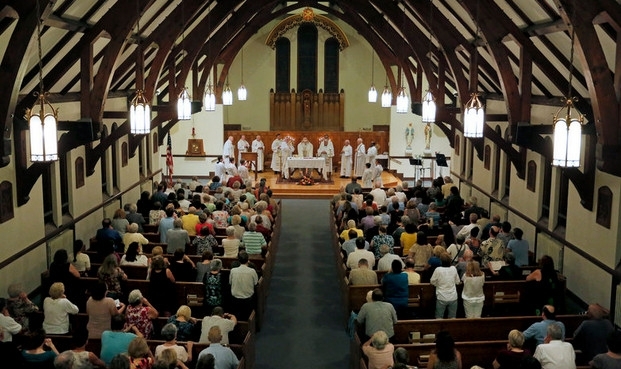 St. John the Evangelist Catholic Church has been the home parish of the Catholics of the Thornton Heights, Redbank, Cash Corner, Pleasantdale, and Maine Mall area since 1940. For several decades it also served the Catholics of nearby Scarborough. The parish was set off from Holy Cross Church in 1926 with about one hundred families. The Rev. Dennis A. McCabe was the first pastor, with the old Mount Calvary Chapel (built circa 1860) in Calvary Cemetery serving as his church. A native of Dundalk, Ireland, he was the pastor until 1938 and was also the superintendent of Calvary Cemetery at the time. Under Rev. John J. Ryan the church you now see on Main Street was built in 1939-1940 and dedicated that June. An Italian marble altar was consecrated that year by its donor, the Most Rev. Joseph E. McCarthy, bishop of Portland. Father Ryan was the pastor for thirty years, residing at 11 Aspen Street near the church, and died in 1974. In 1950, after several wartime housing complexes were built, the population of the parish swelled to 500 families. It reached a peak of 1935 families by 1988 when St. Maximilian Kolbe Parish was created in Scarborough. St. John's Church was twinned with Holy Cross Church in the early 2000s, with the pastor residing on Aspen Street. The old Mount Calvary Chapel was razed in 1987, but the bell was saved and can be seen today along side St. John's Church. 4.33/5 based on 3 votes. Views 336 views. Averaging 1 view per day.